Completed in 2011, Atlantic Wharf Lofts offer upscale loft living in Boston's rapidly growing Waterfront District. Residential units at Atlantic Lofts vary from studios to two-bedroom plus study duplex lofts featuring high ceilings and large windows. Each loft is designed with sleek lines and high quality finishes that reflect your discerning taste – clean lines, white walls, wood floors, and over sized doors. Homes come in various floor plans offering unique custom layouts. The common amenities include 24 hour concierge, a private gym and club room, garage parking, dedicated storage space and Waterfront Park. Atlantic Wharf is a pet-friendly building. 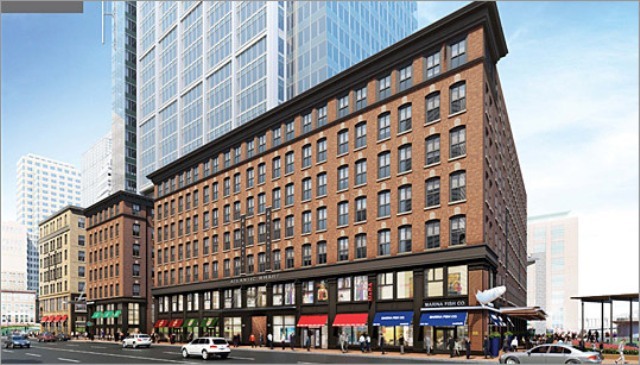 Situated on the corner of Congress street and Atlantic avenue, the lofts are just a short walk to Financial District, Boston's Seaport, historic North End and Beacon Hill neighborhoods. Residents have plenty of choice for fine dining and high-end retail shopping. Contact us to learn more about the Atlantic Wharf Lofts in Boston MA.